A year ago I woke up from trying to sleep sideways in my mostly broken armchair after making one last push to pack up my things for the movers to take to California. It was an inauspicious start to my the day, which ended up being pretty darn awesome. I left Minnesota with a heart so heavy that it dragged on the ground, but something about the endless blue of the sky and the intensity of the sun has kept me sold. A couple of weeks ago Sarah and I walked along the beach — me waist deep in the icy Pacific and her skipping through the frothy edge of the waves — and it felt like what should have been happening all my life. Sarah is here now, living with me, and my huge one bedroom has become a little claustrophobic: we have two offices, a dining table, and a living room jammed into the living room. When I work from home, Sarah makes me the most amazing turkey avocado sandwiches with smoked cheddar and red onions. Eating one is like being punched in the face with happiness. Not that Sarah punches me in the face — that would leave visible marks. Call the police, she hits me! Last night I drove up to The City to attend a small event put together by Scott Beale, lead tentacle of Laughing Squid. I finally got to put my calling/business cards to proper use. I snagged two hours of fantastic conversation and went home feeling elated. I only seem to visit the ocean at sunset. My mother and her husband John came out to visit a week or so ago. Since they left, California has blended into a gray smear of endless blue skies and constant blooming of flowers with occasional bursts of color when I hang out with Don and Mary Ann, but while they were here, we had an absolute blast. 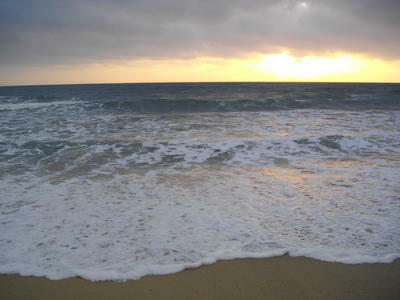 My mother got to play in the ocean surf during the very tail of a Pacific sunset.